“He thought that he had control, and that everything he did, was done perfectly.” How the mighty are fallen when Fool Me Twice opens. Alastair de Grey, fifth duke of Marwick, is not half the man he used to be. He’s a colossal mess: cuckolded by his wife, widowered by her opium addiction. He’s a cowering shambles who’s been hiding in his house for ten months, never leaving his room, body and looks gone to ruin, drinking and brooding on revenge against his wife’s lovers. Into his life comes Miss Olivia Johnson, housekeeper, too young and educated for the position. A bottle flies at her head when she confronts the lion in his lair. Alastair’s characterization is a study in despair and loss of purpose; he is a man who, because he so arrogantly believed in his own intellectual powers, thought he could understand and read people as well … until Margaret, his Victorian trophy wife, proved him wrong: ” … his own ignorance, the immense space of all the things he had not guessed and never suspected. He, who had prided himself on foreseeing everything.” He is a man in need of resurrection, spiritual, intellectual, sexual, emotional. Olivia, a survivor of loss and censure herself, without Alastair’s wealth, privilege, or status to bolster her, has buoyed herself her entire life. Her example strong, it should shame him; it does, but not initially, he’s too sad. Though she’s in his home under pretense, name and purpose, Olivia is a compassionate woman; she cannot help but recognize a wounded creature: “She saw deep shadows beneath his eyes, almost like bruises. He looked like a man in the grip of a fever, burning up from within.” She cannot help but reach out to heal, ” ‘You are so much more than this,’ she whispered.” Miss Bates loved Olivia’s handling of Alastair (who’s lovely in his own right) because it didn’t only take the form of gentle coaxing and caring, Olivia wields tough love (and when it’s couched in literary allusion, all the more credit to Duran and romance meta-fiction): ” ‘ … why do you read Austen if you lack all hope for yourself? Why torment yourself with happy endings if you don’t believe one is possible?’ ” One of the many delights of this romance novel is that the heroine and hero’s battleground is littered not with bruising kisses (though the kisses and more are very nice too, thank you, Ms Duran) but books and chess pieces. Miss Bates loved Meredith Duran’s Fool Me Twice; therein, she found “no charm equal to tenderness of heart,” Emma. Duran’s wonderful romance novel has been available since March 25th from Pocket Books (Simon and Schuster) and found at the usual vendors in the usual formats. Miss Bates is indebted to Pocket Books (Simon and Schuster) for an e-ARC, via Netgalley, in exchange for this honest review. Are you a fan of the cross-class romance? What are your favourites? Does it “work” as well in contemporary romance (is it even feasible there?) as in historical? What are its problematic aspects? No, ’tisn’t of course, it’s difficult to find really great ones, but Miss B. supposes that’s true of all sub-genres. The historical also sees three of the best Miss B. has read in a long while: Cecilia Grant, Meredith Duran, and Jeannie Lin. Yes… Sturgeon’s law may be even more true than usual, but the 10% that isn’t crap has some truly excellent writers. More worth reading than many of the classic favorites, IMO. Miss B. agrees re: “more worth reading than many of the classic favourites” (though listening to two Kinsales recently, Shadow and Star and Flowers From Storm has been pretty wondrous.) The writing is sophisticated, characterization more nuanced, storylines more compelling and original, a case in point, the three writers Miss B. mentioned. Oh indeed, Kinsale is part of the old gold standard… I must catch up with her one of these days. Miss B. thinks you’ll like Shadow and Flowers, but she can’t say the same for the more recent titles. I just absolutely loved the Meredith Duran and for all the reasons you did. Olivia was sooo cool, (mostly) calm and collected. I had wondered how the author would redeem Alistair, who was such the ‘bad guy’ in her previous book (That Scandalous Summer). I was happy she succeeded without giving him a total personality transplant. My three auto-buys in historical romances are Courtney Milan, Sherry Thomas and Meredith Duran. I’ve had mixed luck with Cecelia Grant and Jeanne Lin, so they are currently a ‘get from the library’ authors for me. My favorite Kinsale is ‘Shadow and the Star’. I love ‘Flowers From the Storm’ but its emotional intensity makes it difficult to re-read; I have to be in just the right mood. Whereas I re-read Shadow much more often. Ah, you see, Miss Bates hadn’t read That Scandalous Summer, so was unaware of his bad-guy status. Don’t quite know why that one escaped her, but she’ll redress that. His despair, his loss of confidence in his ability to know others: that was so well done and the take-no-gaff heroine was wonderful, yes! LOL! Miss B. loves Grant and Duran, but Milan and Thomas she respects and reads, but not with the same gusto. It’s looking from this, however, that Duran is the “universal” favourite. Oh I am looking forward to reading this one by Meredith Duran. She’s an “auto buy” author for me. Laura Kinsale’s Flowers From The Storm is probably my most “re-read” book. When I find myself wishing for more from the current offerings in HR, that’s my “go-to” book. Just a lovely book. Have you read Carla Kelly’s Reforming Lord Ragsdale? This is one of the best “cross class” romances I’ve ever read. Emma is such a wonderful heroine, and I love the slow build to her and John’s relationship. Two more: Anne Gracie’s Tallie’s Knight and Lisa Kleypas’s Dreaming of You (featuring a “snaggle-toothed” gaming hell owner paired with a very proper country miss) – both are on my favorites list. There’s a really good article on class differences in historical romance over at Heroes and Heartbreakers. I’m stumped as far as contemporary romances and the cross class conflict. Can’t think of one right now. Miss B. read Flowers … indeed, it was one of the first romances she read after a hiatus from the genre for … sob … 30 years. So many years, so many books … Miss B. is listening to the audiobook of Flowers and absolutely loving it. Loved loved Reforming Lord Ragsdale and Dreaming of You is one of her favourite historical romances, so we share some lovely taste. She’s wanted to read Tallie’s Knight FOREVER, but it’s not available as an e-book, or in print, so she may just order a used copy one of these days. Miss B. hadn’t seen that article, so thank you very much for the reference. Cross-class conflict in contemporary romance is not as readily evident, but Miss B. does like a wrong-side-of-tracks story, especially since watching Splendor In the Grass! Miss B. did argue that Kristen Ashley’s Law Man is a contemporary cross-class romance. Would love to hear your thoughts about Fool Me Twice when you read it! Oh, I didn’t know you were reading this! It’s always a pleasure to read your reviews of books I especially enjoyed. Meredith Duran might be my single favorite romance author, and I thought this was one of her best. Have you read Jeannie Lin’s novella Capturing the Silken Thief? (Set in the same world as The Lotus Palace & The Jade Temptress.) I was struck by how the heroine/hero dynamic in FMT reminded me of the one in CtST. In both cases you’ve got a slightly unscrupulous heroine who’s socially beneath the hero, and in both cases each sort of envies and admires the other: he, because of the gumption and initiative with which she goes after what she wants (unlike his relatively rule-bound existence), and she, because he has the skills and qualities to really be somebody, which is not a possibility she’s ever seen for herself. In Miss Bates’ humble opinion, Meredith Duran is the anti-dote to histrom nay-saying. Miss B. has loved all her books because the writing is always good and the characters, though at times difficult, consistently interesting and complex. Your take on the cross-class romance is so cool. She’d say the cross-class motif, at least in historical romance where it’s more likely and more likely to “work,” is one organizing principle to what makes for a great romance narrative: the moments in the romance when the heroine and hero both recognize something in the other that binds them in commonality (love this moment of recognition and it’s done so well here) and is yet aware of the very “otherness” of the other, his/her alien-ness, so to speak. But Miss Bates loves this idea, and it’s so perceptive psychologically, that we are attracted (it takes the form of admiration?) to those qualities that we most crave in ourselves. So interesting. Even though I primarily read mysteries now, I still will buy Meredith Duran’s historical romances and read them. Has she topped her first book yet? The Duke of Shadows? Loved the first half of that one and have read two more of hers that were okay but not great to me. But anyway, enjoyed reading your review. I think cross class romance in historicals are more interesting or more satisfying to me as a romance because it epitomizes the “true love” that sees no class or differences whether that’s believable or not is up to the writer to sell it to me but I love it. Not a very big fan of contemporaries and have put my finger on why. If you were to look in my library it would be more historical romances than anything. Love, love, love Laura Kinsale’s books. Reread FFTS several times. MissB still loves to read some mysteries as well: she used to read many many more and now has switched to reading romance! So, it’s an interesting reversal of your reading journey, but MissB thinks that these two genres dominate pleasure reading and they ebb and flow in readers’ choices. They both bring us different pleasures: Miss B. definitely reads romance for the connection and unfolding of the HEA and she loves mysteries because she’s so keen on seeing justice being done. But her favourite mysteries tend to be of the “malice domestic” variety with strong romantic elements, so if you have any suggestions for her … she’d love that. Duran is a favourite with Miss Bates and always worth reading. She loved Duke of Shadows and, like you, was more enamoured of the first part in India than the second in England. Then, Duran’s next three books, Bound By Your Touch, Written On Your Skin, and Wicked Becomes You, were, if not disappointing (because flawed or not, Duran is always worthy reading) then “less than” her début. Miss B. doesn’t know if you’ve read them, but A Lady’s Lesson In Scandal, which is Duran’s most interesting treatment of a cross-class romance, and At Your Pleasure wherein the heroine and hero’s conflict is religious rather than class, are absolutely magnificent. The latter in particular reminded Miss B. of Judith James’ Libertine’s Kiss, which is equally wonderful. I wish I had a lot a recs for you but my taste in mystery tends to runs towards police procedurals and noir. I like dark. I don’t mind mysteries with strong romantic elements either but I’ve been reading so many without them that I don’t miss them I’m afraid. Have you tried Julia Spencer Fleming yet? Her series would fit the type of books you like (I think and they don’t have the most popular start either) or Dana Stabenow’s Liam Campbell series with Fire and Ice. There’s just four books in that series and they have a strong romance in them but you may not like how it got started either. If I think of more I will let you know. FFTS is the best historical romance I’ve ever read. Love the ending! Hello to you and thank you so much for the recs! Miss B. has read the first three books in Spencer-Fleming’s series and liked them a lot! She’s still got a few in the TBR, though she heard Twitter grumblings about the latest. She’ll check out the Dana Stabenow, but she has to read in order because that’s the way of the precise spinster’s world. 😉 BTW, Liz over at Something More has an interesting post on her latest mystery read, which she calls a “cozy noir.” Cool. Miss B. just listened to the seduction-by-kitten scene in FFtS … one of her favourite scenes in romance ever! I loved this book! The upcoming Loretta Chase (Vixen In Velvet) is cross-class and very enjoyable. I also loved Julie Anne Long’s How The Marquess Was Won — my favourite in the Pennyroyal Green series, and it can be read out of order. Although I love Kinsale, I was never a fan of Flowers From The Storm…until I heard Nicholas Boulton narrate the story. I still think Christian is horrible, but I understand him better now. 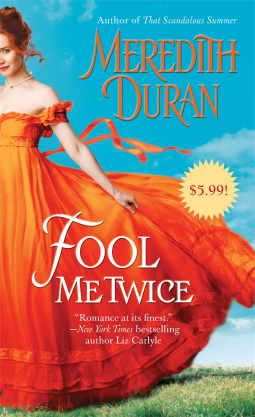 Miss Bates loves the sound of “I loved this book!” It’s been echoing about Duran’s Fool Me Twice, from her hairdresser to her doctor-BFF. It’s so great to see a book recognized. Miss Bates hopes it ends up in a lot of year-end fave lists: it certainly will on hers. Miss B. has the first in Chase’s series in the TBR! And several of the Pennyroyals too: glad to know it’s your favourite. Yes, Miss B. agrees on FFtS: though she respected it when she read it, she had a very hard time of it. “Maddie Girl” was prissy at times and Christian … well, so arrogantly unlikeable. But listening to it has been divine.